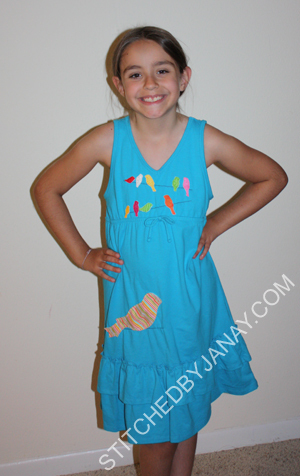 The design is 3 rows of birds, but I was limited by the space on the bodice, so I deleted the third line. This light airy design made it easy to fill the space on that dress even with the gathered waistband. I wanted something big on the bottom, so I used Lynnie Pinnie's Simple Bird. 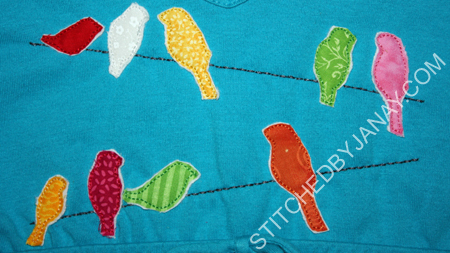 But since the flock of birds at the top was finished with a triple bean stitch, I didn't want the thick satin stitches on LP's bird. So I simply used her tackdown stitches and left it raggy. I merged it with a line from the HTD design, but it doesn't really show up well as Annaliese wears the dress. Annaliese helped me pick all the fabrics for this. 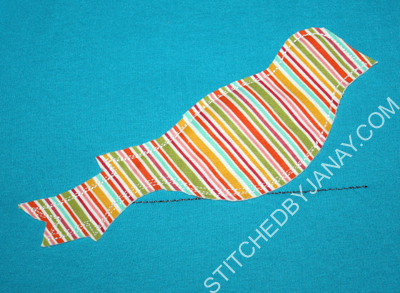 Once we selected the stripe for the large bird, I let her pick the nine fabrics for the little birds from my scraps. And I mean scraps! These birds are tiny and don't require much fabric at all!! I did use a layer of white felt under them to help the color pop and not be dulled out by the dark background. Two more dresses... a pink and a purple. I need to figure out what to put on them ASAP! 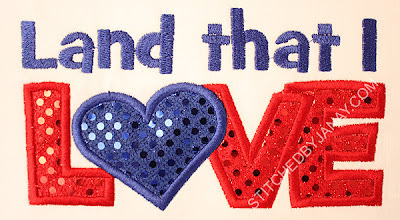 When I had the opportunity to test the Land that I Love design for Lynnie Pinnie, I spent some time debating which fabrics to use... go blingy or Americana? Ultimately I decided to do both! 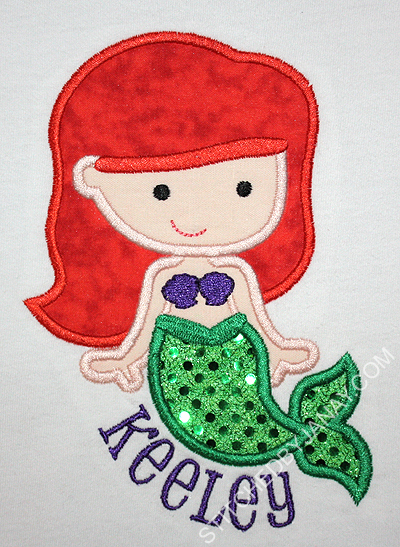 For those of you that do custom embroidery, if you've never worked with sequin fabric (technically called confetti dot) don't be scared to try it! 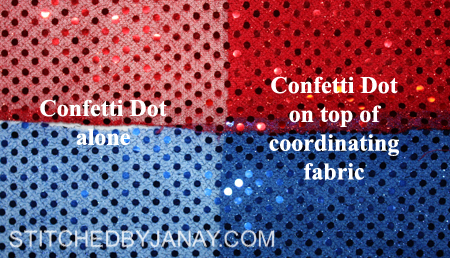 On it's own it is pretty thin, so my preferred way of using confetti dot is to fuse it to another colored piece of fabric using Heat and Bond Lite before using it in my applique design. This not only provides stability, but really helps the colors pop. 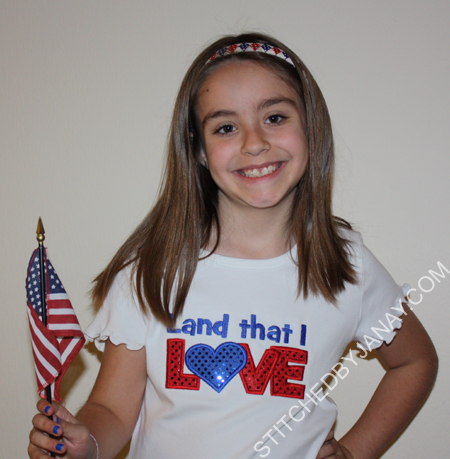 For myself, I used this neat wavy stripe fabric I have in my stash -- love it for patriotic designs! Two little girls I know had birthdays this week, and they each got a special shirt! 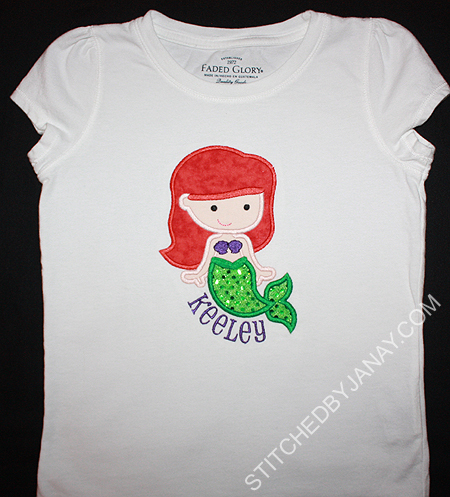 The Cutie Princess as Ariel is from Lynnie Pinnie. Isn't she so cute?! Love how this turned out with the sequin material. I used the Kelsi font from 8 Claws and a Paw to add her name. I'm usually not a fan of mixed case fonts, but I really wanted to pick something where the height of each letter was the same (it looked better curved beside the tail) and it came in 3/4" size, which was perfect! I immediately thought of Designs by JuJu's Gymnasts set, and Michele picked this one on the balance beam. I added her name with my favorite girly font Swirley from 8CP. Words cannot express how thoroughly I enjoy watching LP and DBJJ designs and 8CP fonts stitch out. Lyndsie, Julie and Julie do a phenomenal job digitizing. Their work is always flawless with no surprises. I cannot recommend them enough!! 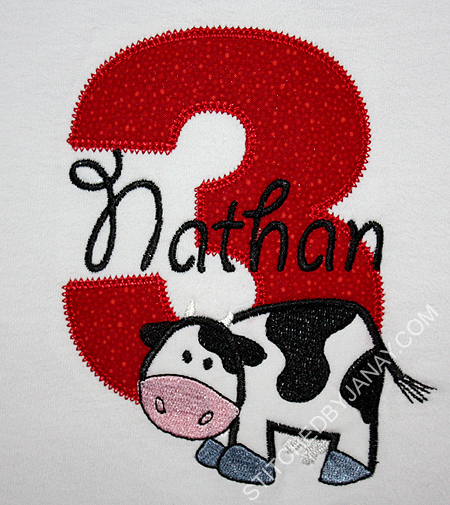 The "3" is from GG Designs' Chubby Wubby Numbers. The cow is from Designs by JuJu's Barnyard Buddies set, and I added his name with the Clay font from 8 Claws and a Paw. 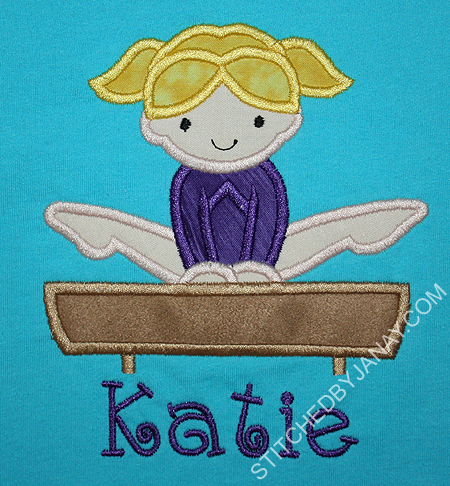 For those of you who do custom embroidery (and my friends who just can't get enough of my wordiness, ha!) let me explain what I do when I create a look by overlapping designs. I like to do some design editing in my software beforehand. First of all I needed to modify the precious cow from DBJJ. This was for a boy, so the flowers had to go. For space reasons I decided to remove the appliqué grass patch as well. 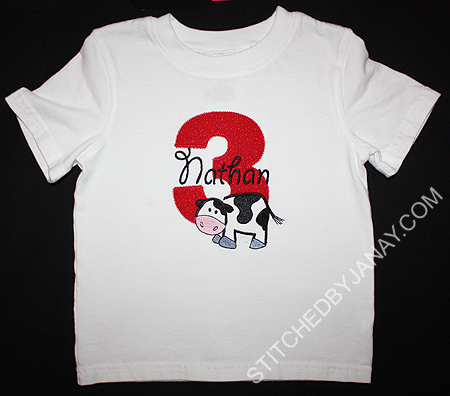 Nathan loves black and white cows, so within Embird I changed the colors to give his mommy an accurate preview before stitching. 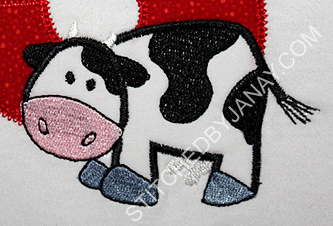 Once I merged that on top of the appliqué 3, I removed the unnecessary zigzag stitches on the 3 that would be under the cow. That's relatively easy and quick to do in Embird. However, I don't bother changing the placement and tack down stitches -- that's too much work! Instead I did creative cutting in the hoop, since I knew the red fabric on the bottom would show through the white fabric on top. 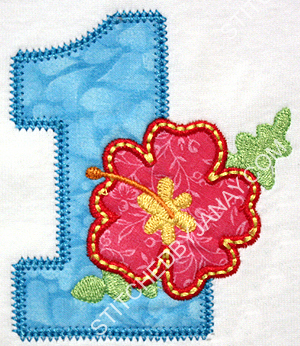 I ran the placement, tackdown, and modified zigzag stitches for the "3". Then I ran the placement stitch for the cow and removed my hoop from the machine. 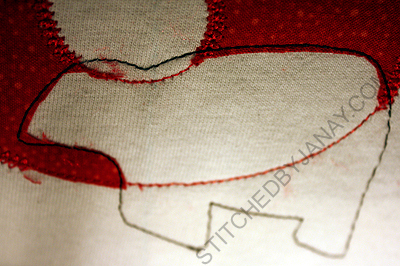 Oops, I used red thread for my placement stitches, and it WILL show through my white fabric! So I picked those stitches out, too. 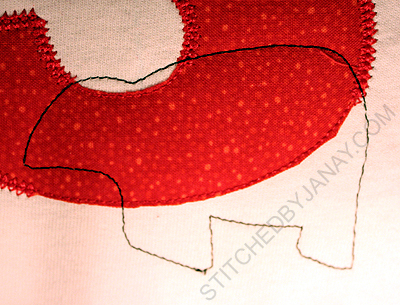 Note to self -- use white thread for placement stitches next time. It's a little extra work, but worth the effort! That cow is a bright white without any discoloration! See how much better the flower looks when the fabric underneath is trimmed away? Just a little detail that I like to keep in mind. I didn't notice the problem on the first shirt until it was done. I'm always trying to improve my final product! 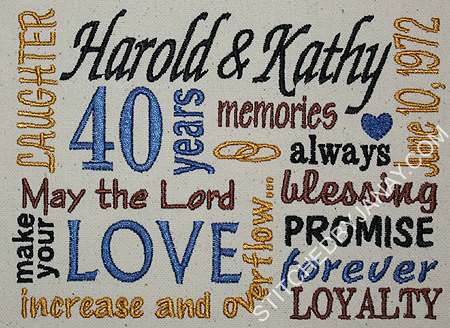 Today is my in-laws' 40th anniversary! I am so thankful for their wonderful example of a godly marriage -- it makes mine possible since they laid such a fabulous foundation for my husband. I'm grateful for their love and friendship. Then I modified it a bit more to incorporate the scripture. (I'm confident Krissy would have done a beautiful job herself, but in true Trammel fashion, inspiration didn't hit until the very last minute and I couldn't expect her to meet my requests on such short notice. She was super fast with swapping out the name, number and date as it was!) I love the beginning of 1 Thessalonians 3:12 so I swapped out the text around LOVE and replaced it with the scripture. I really like how this turned out! It took me a while to figure out what color threads to use, but I settled on gold, brown, black and blue to coordinate with the Labrador quilted wall hanging I made for Kathy several years ago. 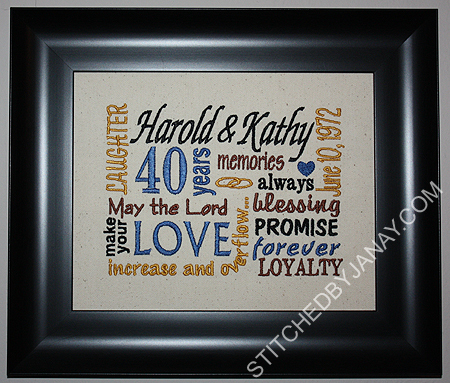 Stitched on canvas, stretched over foam board, and placed inside an 8x10 frame without glass. 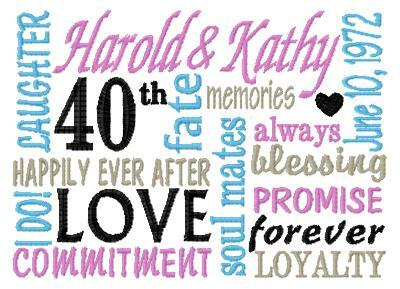 So, congratulations Harold and Kathy! May the Lord make your love increase and overflow for each other for many more years to come. Happy Anniversary! 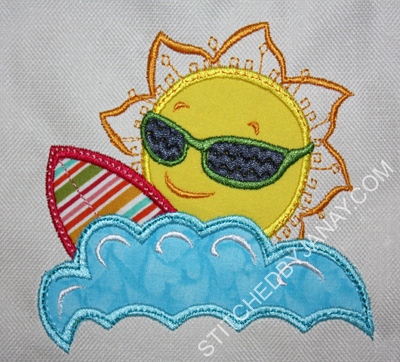 If you do custom embroidery and you are not a part of an online group or forum, you just might be missing out on some awesome ideas! 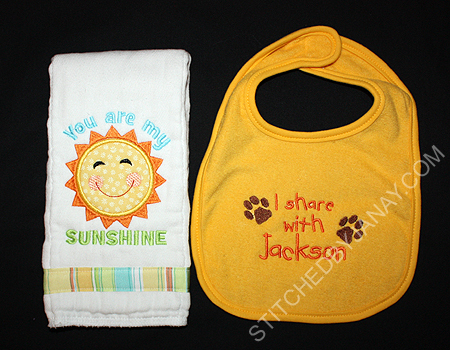 This post is filled with things I've made for my family inspired by other stitchers... FROM DOLLAR TREE! That's right folks, grab a $1 item, add some embroidery, and suddenly you have a boutique item! (whew, that's not as easy as you would think!) we settled on Miss Kitty from 8 Claws and a Paw. Honestly it wasn't my first choice (Southern Belle was), but I knew Annaliese would bring it up every time we sat down for dinner, so I went with her first choice. ;) And hey, it was only a $4 experiment! 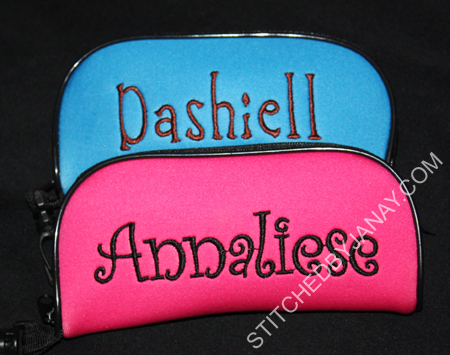 Next, sunglasses cases! I can't give a source for the font I used for Annaliese, it appeared in my inbox from a friend. :) I love it though, it's like Curlz without the annoying tiny curls! I made Annaliese's a couple weeks ago. Dashiell is starting to notice when I make things for her and not him. This week he told me that he wanted a sunglasses case with his name on it. He insists that his favorite color is dark brown (???) and was quite distraught when I told him that Dollar Tree didn't sell brown sunglasses cases. Oh dear, we talked about this in great length. 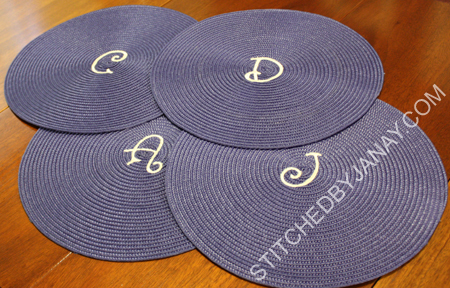 He finally settled on a blue one with dark brown thread. :) I used Dream from 8CP for his name. 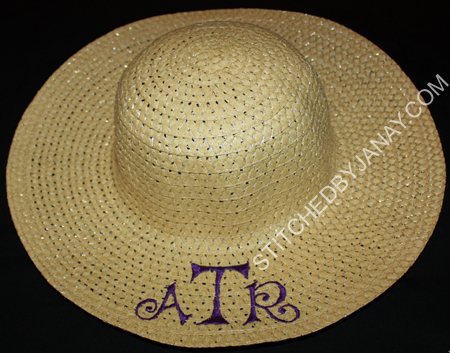 How about a sunhat?? You can find these hats a lots of locations for a variety of prices, but for an experiment for an 8 year old, a $1 hat is PERFECT. 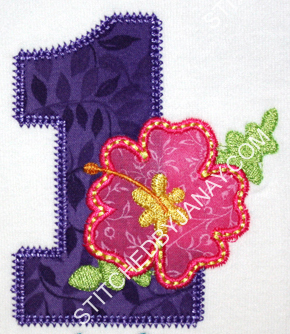 I used Pizazz from 8CP to do Annaliese's monogram, and picked purple thread to match her new swimsuit. 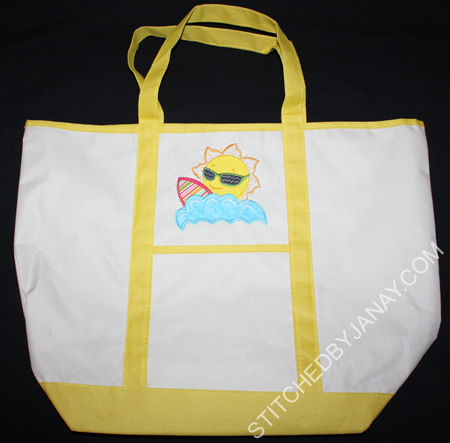 Finally, a new beach bag. Dollar Tree is selling these awesome canvas totes! They are a great size and I'm anxious to put it to use. 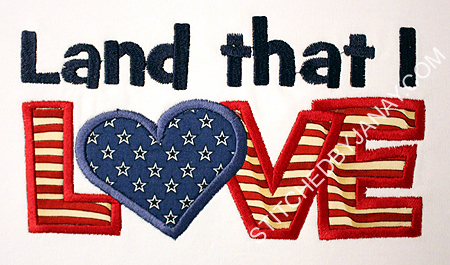 This design is from Luna Embroidery. LOVE the striped fabric that my mom bought for me when she was here last week! So what are you waiting for?? Get yourself to a Dollar Tree!! It pays to be a tester for Lynnie Pinnie! After searching the internet for a cute design and coming up dry, I asked Lyndsie if she would have time to whip something up for me. 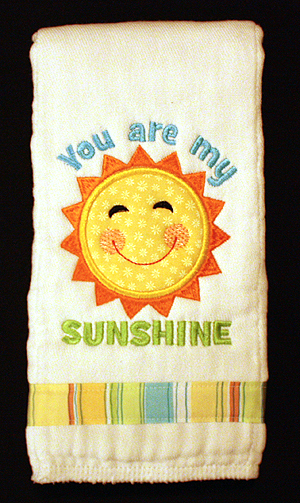 She did, it's perfect, and now you embroiderers can get the "You Are My Sunshine" design yourself! Tiffany wanted to reuse the idea she requested WAY back when I just got started. 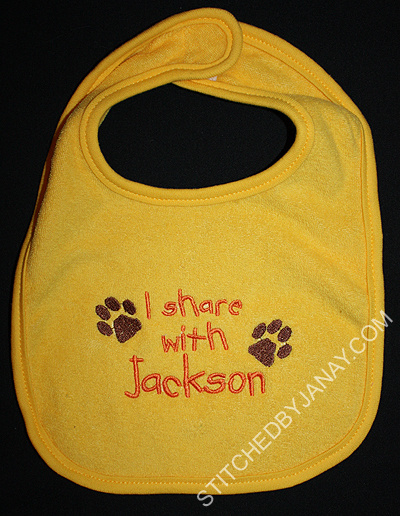 Jackson is the name of the family dog and is sure to be enjoying table scraps soon from this baby! :) The text is Embird Alphabet #18, and the paw prints came from Sew Forum (no longer available). Kathie bought this adorable little robe to give as a shower gift, and asked me to applique a lion on the back. 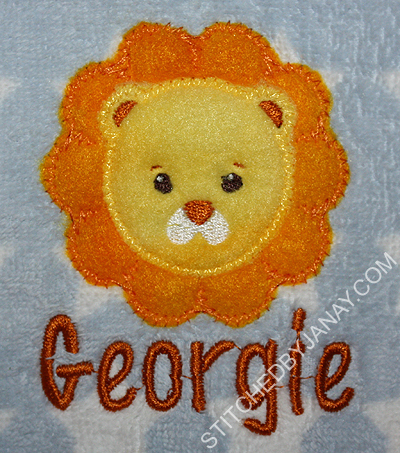 I used Applique Momma's Lion design but only used the head. Would you believe that I used one type of fleece for this lion? It's a marble fleece (used it a couple years ago for a VBS lion craft) and I was able to isolate a bright yellow spot and a bright orange spot. Cool, huh?